A single phone with two different looks telling a brand new story. 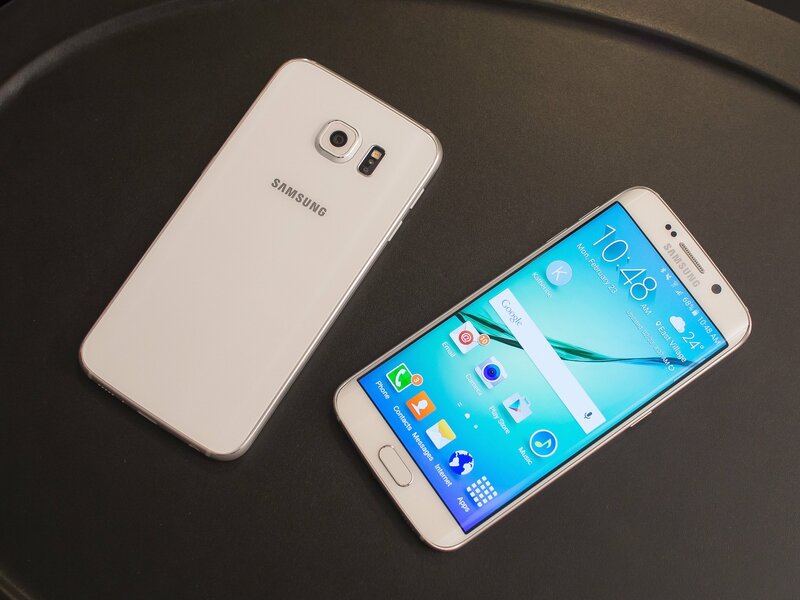 The Galaxy S5 was hardly a flop. Tens of millions have sold since its introduction last year and you'd be hard-pressed not to see one in use on the street in any populous city around the world. But despite its success relative to other devices in the market, the prevailing feeling about the GS5 is that it didn't live up to the expectations of a flagship smartphone in 2014. Those shoes were instead filled by the Note 4 launched later in the year, with its superior materials, more refined design and improved camera performance. Samsung, naturally, is hoping to put the Galaxy S series back on people's radar as a top device, and it's doing so by starting afresh with the Galaxy S6 and S6 edge. Though it numerically follows the GS5, the Galaxy S6 bears little resemblance to the previous model, and marks a pretty significant change in the way Samsung designs phones. At the same time, the S6 edge picks up the fun parts of the Galaxy Note Edge and leaves behind the poor software experience. There's a brand new design philosophy in play with the Galaxy S6 and S6 edge, starting with the radical hardware change and flowing into a more considered software experience. These are the phones that Samsung's hoping will change the perception of its devices in 2015 — let us show you what they're all about. We're taking a look at the Samsung Galaxy S6 and its curved cousin, the Galaxy S6 edge, unveiled at Mobile World Congress 2015 in Barcelona. We've only had a little alone time with both phones thus far, enough to form some initial impressions and to get a pretty good feel and what Samsung has going on here. Android fans, myself included, were particularly excited by Samsung's move towards metal in its phone designs, starting with the Galaxy Alpha and Galaxy Note 4, and expected the Galaxy S6 to look a lot like these devices. Little did we know that Samsung had been cooking up something new altogether, using metal but in an entirely new way that frankly bares little resemblance to the Alpha and the Note. 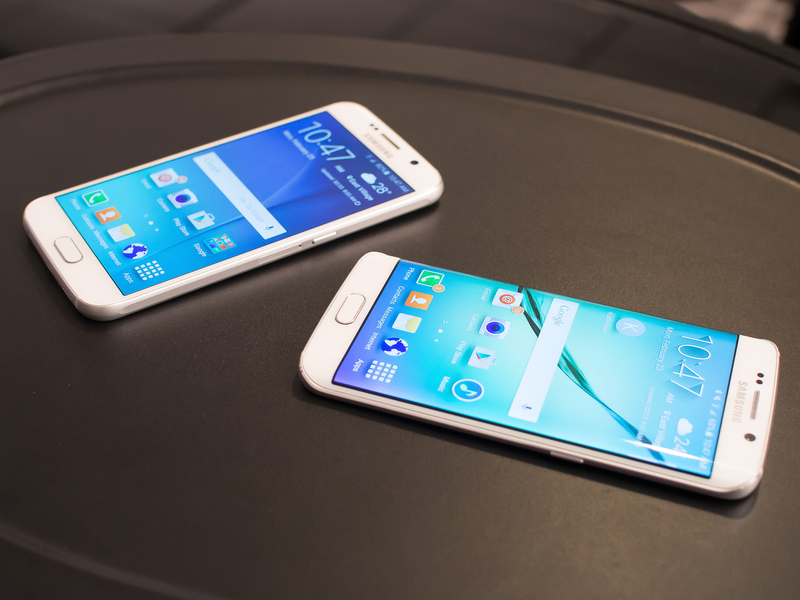 Equally shocking is how little the Galaxy S6 resembles its predecessor, aside from the rough shape and size. 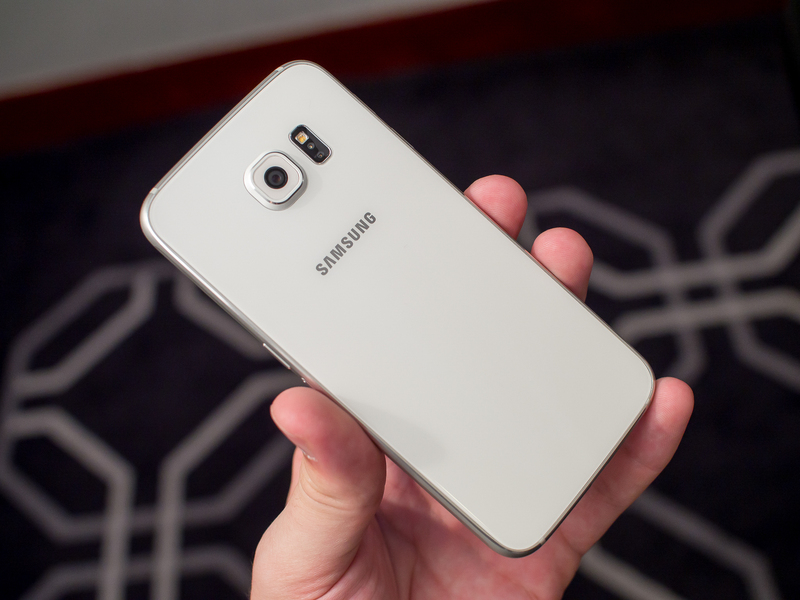 Front-on, the Galaxy S6 looks familiar. Its 5.1-inch display is the same size as the S5, though the overall dimensions of the phone have been reduced — 2mm shorter, 1mm narrower. A standard earpiece speaker sits above the screen next to a new 5MP front-facing camera, and below the screen you'll see a taller-than-usual home button flanked by standard Recents and Back keys. The larger home button isn't just for looks — it now contains a one-touch fingerprint sensor, ditching the finicky swipe model of the GS5 and Note 4. A solid metal frame wraps the entirety of the Galaxy S6 and S6 edge's exterior, creating a smooth silver filling between two pieces of ever-so-thin glass that adorn the front and back of the phones. The frame is a continuous piece that runs through the center of the device, with modest, necessary cutouts for antennas, buttons and the SIM tray being the only breaks along the lightly brushed exposed parts. The edges are smoothly rounded, which makes it much more pleasant to hold than the angular affair on the Note 4, with flat portions shaved down along the long edges for a touch of personality. Samsung has kept the side-mounted power button along the right edge, with new individual volume up/down buttons replacing the rocker on the upper-left edge. The headphone jack has dropped to the bottom of the phone, opposite the USB port (sans annoying flap) from a drilled speaker grille that replaces the previous back-mounted one. Samsung says it's 50 percent louder than the S5, and we agree it sounds less terrible than last year's model. The GS6's curved metal frame is sandwiched between two sheets of Gorilla Glass 4. Yes we did mention two pieces of glass earlier — the Galaxy S6 and S6 edge indeed have full panes of Gorilla Glass 4 on both the front and back of the devices. That's the same tough, clear stuff that you'll find on the front of the Note 4 and several other leading devices, and Samsung was at pains to tell us how meticulous the process of making that glass is. In the case of the S6 edge we're dealing with a single piece — curved on both sides — of 3D glass for the front, with so-called 2.5D glass adorning the front of the S6 and the back of both phones. In terms of feel and aesthetics, it makes these devices feel particularly high-end, although if you've ever used a Nexus 4, Huawei Ascend P, Xiaomi Mi Note or late model Xperia Z you're accustomed to what glass on the back can offer. The glass meets the metal frame perfectly, and the sharp curve is particularly impressive on the S6 edge. It's hard to overstate how big a difference the materials and design of the S6 series makes. It really set them apart from previous Galaxy S devices and even the relatively-new Note 4. This is the kind of premium smartphone everyone has been practically begging Samsung to make. This is the kind of premium smartphone everyone has been practically begging Samsung to make. On the more practical side of things, the glass on the back is bound to scratch over time (Gorilla Glass is strong, but not invincible), and it does make the phones a bit slippery compared to the rubberized Galaxy S5. Integrating this glass into the S6 series also means the phones don't have a removable back plate — in turn sealing the 2,550mAh battery (or 2,600mAh on the edge) in the phone and removing the microSD card slot. That's a big deal for many, but Samsung doesn't see it as a compromise — the designers consciously made these decisions when building the Galaxy S6 from the ground up. The brilliant look and feel of the Galaxy S6 and S6 edge is alone worth the tradeoff of a sealed case for many, but beyond that it provides a few other perks. The Galaxy S6 comes in at just 6.8mm thick, with the S6 edge being a touch thicker at 7mm — both much thinner than the 8.1mm GS5. 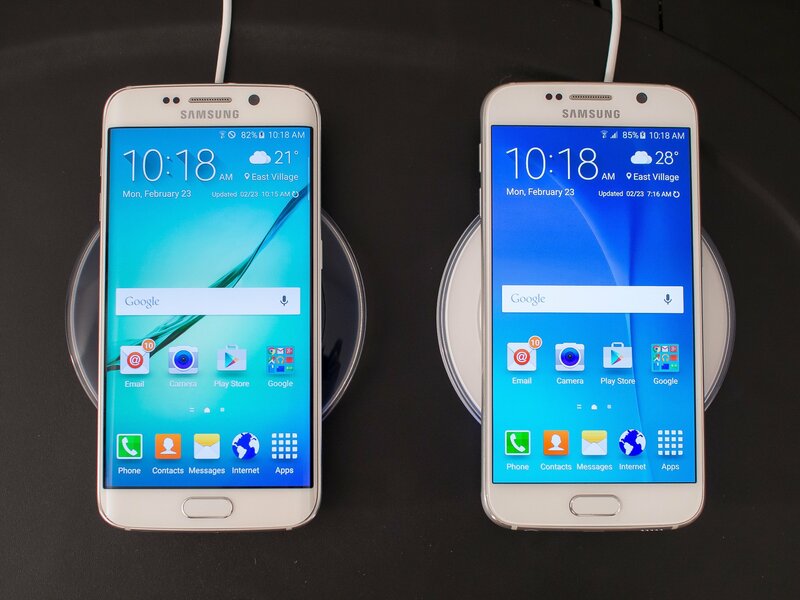 Galaxy S6 and S6 edge: What's the difference? You'll notice I've been referring to the Galaxy S6 and S6 edge together as a single entity — that's because in all practical terms these phones are identical aside from the screens. No more "edge screen." Instead the S6 Edge brings subtle swipe-in gestures. On the Galaxy S6 edge, the screen sharply curves off both long edges of the phone at a slightly tighter angle than that of the Galaxy Note Edge due to its smaller display, and unlike the Note Edge doesn't have dedicated software that occupies the edge at all times. The idea of an "edge screen" is gone, replaced by subtle swipe-in features for launching a quick contact manager and seeing missed calls. Because of the symmetry of the edges you can also configure the swipes to be registered from either edge. Beyond those simple swipes and a couple of features like a desk clock mode and some notification alerts when the phone is face-down, the S6 edge acts the same as the S6 in all other aspects. The software simply fills the full screen, even the curved parts, and you can do everything with it you would do on the other model. Naturally the curved screen necessitates the removal of some exterior metal on the sides, but Samsung has thankfully managed to keep the power and volume buttons in the same locations as the standard S6. The SIM tray moves to the top of the phone rather than the side, but the rest is the same. In my brief time with the S6 edge I have to say it was a bit tougher to hold onto than the regular S6, as your hand is rarely touching anything but slippery glass — but the smaller size helps counteract that issue. The combination of the size and the fact that the software experience is dramatically better than what I experienced on the Note Edge means the S6 edge will appeal to more people, but the standard S6 is still likely to sell in far larger volumes. The Galaxy S6 and S6 edge will launch internationally (no word on the U.S. market yet) in one of three color choices — black, white and gold — with each model getting a fourth color exclusively. The Galaxy S6 will come in a bright blue, while the S6 edge gets a very unique deep green option. Every color has the same matte silver metal band around the edges and only changes the color of the front and back, save for the gold model which has more of a champagne tinge to the metal surround. The color palette provides several options to fit a variety of tastes, and the way that Samsung has designed the phones makes them particularly interesting to view from different angles. The color itself isn't actually in the glass, but is situated an insanely-tight 0.1mm underneath the glass exterior. This lets light bounce around and makes the color change depending on the angle at which it's viewed. The bright blue and green options often look similar when viewed at odd angles, and we think it's a really cool effect from a design standpoint — whether or not I could live with that forest green phone on a daily basis or not is another question altogether. Samsung pretty much blew everyone away with the quality of the Note 4's display, touting the best brightness, colors and resolution of any available phone she while also retaining accuracy, viewing angles and modest power consumption. There's not much you could ask Samsung to change about that display, and so it has taken all of those traits down to a smaller size in the Galaxy S6. The 5.1-inch Super AMOLED display is now QHD (2560x1440) resolution, which is the same as the Note 4 in the smaller package, leading to a quite ridiculous 577 ppi. It looks great, particularly at the intensity of 100 percent brightness, and we were unable to find a single flaw with it. The same display is used on both models, with the obvious exception of it being curved around the sides on the S6 edge. Unfortunately I wasn't able to use the phone outside so I couldn't get a feel for outdoor visibility or viewing angles, but considering it's based on the same tech that made the Note 4 outstanding in those areas I see no reason to expect the Galaxy S6 to be any different. The only real worry here is how the extra resolution will hit performance and battery life — and we'll need more time to assess that. 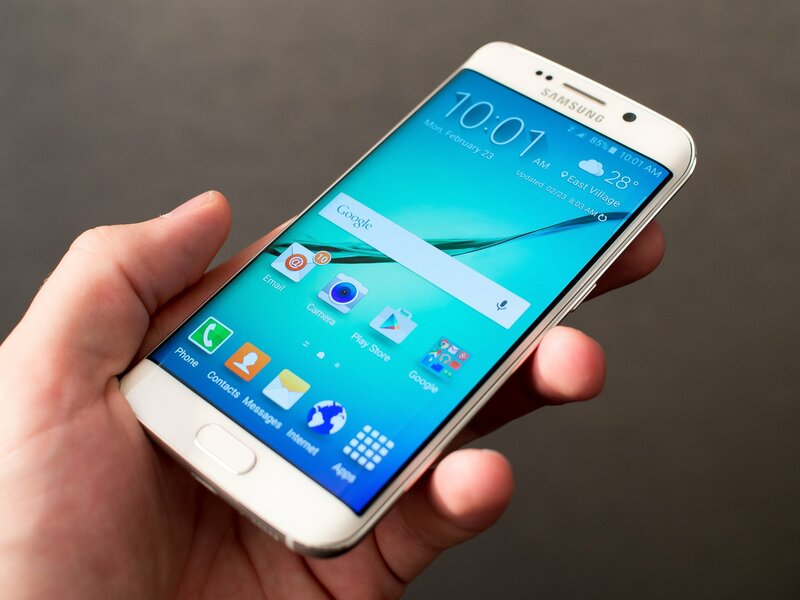 As rumored, Samsung's using its own 64-bit Exynos processor in both Galaxy S6 models. It's clear that the design of the Galaxy S6 and S6 edge is more important than the numbers on the spec sheet, but of course one isn't worth much without the other. As long rumored to be the case, Samsung is going with its own in-house Exynos processor — a 64-bit octa-core unit based on a new 14nm manufacturing process — for the Galaxy S6. While it had previously used a mix of Exynos and Qualcomm's Snapdragon for devices depending on the market, going all-in with Exynos lets it have one consistent platform, benefiting from that more efficient 14nm process across the board. And considering that there's a relatively small battery in these phones it'll need all the power-efficiency it can get. Joining the Exynos processor is a healthy 3GB of RAM, and we wouldn't expect any more than that at this point. While Samsung chose to ditch the microSD card slot on the Galaxy S6, it is making up for it by (finally) setting the base internal storage to 32GB. There will also be 64GB and even 128GB models available as well, though we honestly don't expect all three storage capacities to come to all areas of the world. Samsung says its data shows that microSD cards weren't actually being used as often as we may think, and when combined with new higher storage options it makes more sense to drop the slot. PowerMat and Qi charging are supported out of the box. 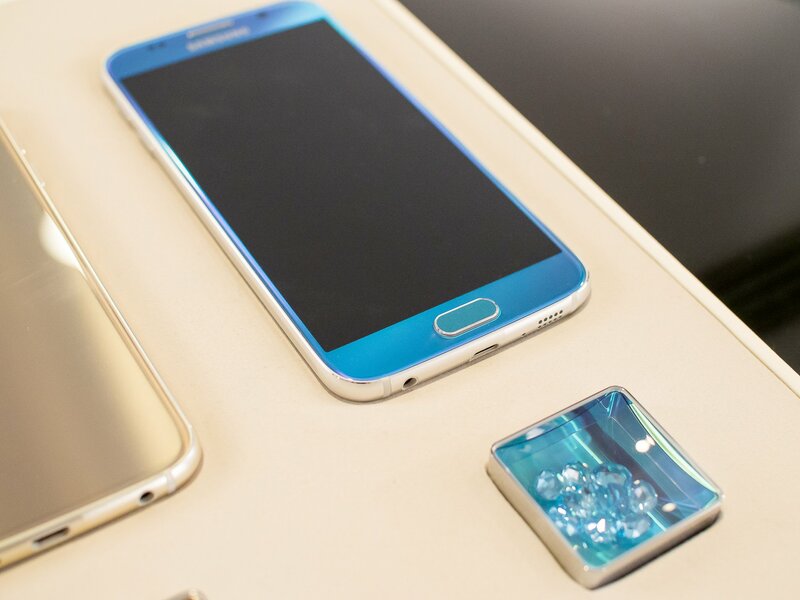 The sealed case and glass back on the Galaxy S6 gives Samsung greater freedom in what it can fit inside the phones, and that means for the first time we have devices from the manufacturer with built-in wireless charging. Both phones support both WPC's popular Qi and PMA's fledging PowerMat standards, burying any doubt that your phone will work on any given wireless charging pad. Samsung is also introducing a new Qi charging pad of its own, which will be available in both blue and white colors closer to launch. The last big parts of the Galaxy S6's spec story are the cameras. The Galaxy S5 was definitely hindered by its camera's poor low-light performance and speed issues, and Samsung is really putting its best foot forward with the sensors this year. The front-facing camera gets a new sensor as well, a 5MP unit behind a f/1.9 lens that produces much better shots than the GS5... but looks only marginally better than the really good 3.7MP sensor on the Note 4. This'll do just fine for selfies. While the hardware story on the Galaxy S6 is brand new and very exciting, the software side of things hasn't changed as much as some might've expected (or hoped). Many Galaxy S5 and Note 4 users around the world have started to get a taste of Android 5.0 Lollipop via firmware updates in the past few weeks, and what they find on their newly-updated phones is a pretty good indication of what to expect on the Galaxy S6. This is Android 5.0.2 and TouchWiz throughout, with few visual changes being made from the Lollipop updates that have hit other devices. The notification shade now has just the top row of quick toggles and loses the drop-down menu, while the settings are a familiar white with pops of color. Plenty of neon blues, yellows and greens are still found all over, though you can see Samsung is slowly progressing toward phasing these eye-popping colors out. In an astonishing turnaround, the international units we used were missing Lollipop's questionable priority notification features, instead opting for a plain mute/vibrate/volume option when pressing the volume buttons. Samsung proudly claims it cut back on the features "by 40 percent" compared to the GS5. When it comes to the feature creep that has defined Samsung phones of old, the GS6 still hasn't completely escaped from that bucket of bells and whistles. Samsung proudly claims it cut back on the features "by 40 percent" compared to the GS5, which is great, but there's still a good number of apps and settings to wade through. You'll find S Voice, Milk Music, Milk Video, Galaxy Apps and a bevy of Samsung utilities installed, as well as the Galaxy Apps store to summon forth even more. Microsoft has also found a place in the app drawer, with its own folder holding Skype, OneDrive and OneNote apps. The Multi Window (multitasking) experience has been improved and streamlined a bit, with fewer options to mess with when managing two windows on the screen. Samsung has also brought the ability to run apps in individual movable windows down to this smaller screen, though this isn't quite the productivity boon it was on the Note 4 considering you don't have an abundance of room on the GS6. In our brief time with the Galaxy S6 and S6 edge we weren't able to come to any definitive conclusions about the performance of Samsung's Exynos processor, but equally we didn't see any cause for concern. Hours and days of use in real-world situations will have to determine how it holds up compared to the competition. The Galaxy S6 alone is an extremely bold move for Samsung, one that smartphone enthusiasts have been pushing it to make for some time. And then you have the S6 edge, which is a phone with a curved screen that's actually compelling in ways the Note Edge never was. The completely new hardware approach is a shot directly at those who have doubted Samsung's ability to make high-end phones that feel appropriate for the price, and the first impression is that it did so without any major compromises. Of course, on paper the battery size may give pause considering the high-end internals and screen resolution, but judgement can't be passed on that just yet. And while the lack of microSD card may be an issue for some, the boost in internal storage will remedy that and is in many ways preferable. I have to say I'm excited to use the Galaxy S6 in the same way I was for the Note 4, which is something I haven't felt about another Samsung device in some time. There's a lot to get you interested here — and if it holds up as well in the long term as it has initially, then we're in for a great experience with the Galaxy S6.